Using coasters is an excellent way to protect wooden tabletops from moisture and condensation. Prevent water stains and rings easily by providing your customers with coasters. Perfect for beer mugs, water glasses, sodas, and cocktails. These coasters are designed to be used once and then disposed of. They can be recycled with other paper products. This item is perfect for restaurants, bars, pubs, hotels, motels, and more! They should be served to every customer ordering drinks, and placed in hotel/motel rooms. FIRM CONSTRUCTION: These coasters are made from 35 point natural pulp board. They are firm enough to hold moisture from the condensation from glasses. They are round in shape, and 3.5" in diameter. DESIGN: These coasters have the NRA stock design. 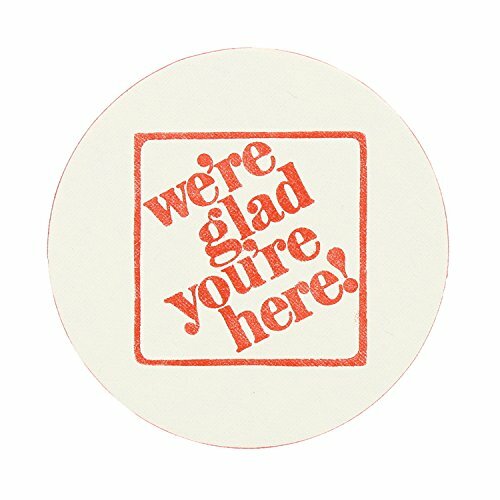 White background with red print reading "we're glad you're here!". Show customers you appreciate their business with your words and décor. ESSENTIAL RESTAURANT AND BAR ITEM! Coasters are an essential item for any bar or restaurant. They are an important part of each table setting, and should be placed under every cup, mug, and glass. Perfect for beer, soda, and water. PROTECT TABLETOPS! Using a coaster prevents glasses and mugs from coming into direct contact with tables. The coaster will help absorb the moisture from the glass, which will prevent a ring from developing. Keep your tabletops looking new and in good condition!